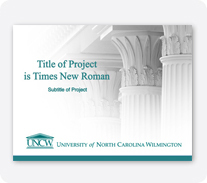 These downloadable templates are offered to create presentations consistent with UNCW's branding guidelines. 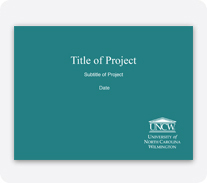 The Office of University Relations is not responsible for content in presentations using these templates. Please note that when creating large and/or high-res files, or altering background images within these templates, you may encounter unavoidable technical difficulties with PowerPoint (slow loading, decreased rate of keyboard response, etc.). 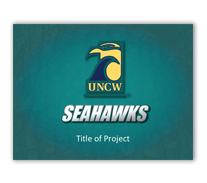 If you require assistance, please contact OUR@uncw.edu.